"Trying to Find Love... 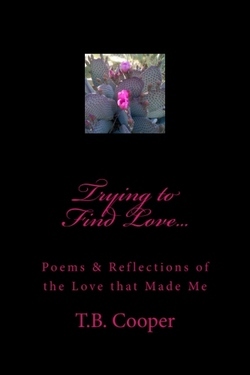 Poems & Reflections of the Love that Made Me"
Long ago, a young woman survived a period of passionate love affairs that shaped her future. That woman was me. Saying my early adult life was turbulent, is a slight understatement. I had fun, I broke hearts, and I had mine broke more than enough to compensate. Music Helped me. I'd always hoped to be a fabulous songwriter, but as I evolved, I realized that path would've just led me to more heartache. I grew up, and so did my way of dealing with my emotions. Music, sadly, has left my heart. I no longer hear inspiration on the wind. ​Instead, I now enjoy peace and quiet..... on a farm with a million kids and animals! But I still remember where I came from, who I loved, and who loved me. It is to honor their place in making me who I am, that I decided to share the "song" and tell the story of how each "poem" came to be. I hope you enjoy this very private peek into my heart. I won’t make any outrageous claims to a troubled past or anything that might excuse my behavior now, or then. I alone, know my demons. I live today with a clear conscience knowing that every step of the journey has been worth it. I do not hold grudges, nor do I apologize to those who do. I regret nothing. I have fought for my happiness; friend and foe, and worse.. myself. and I am LOVE incarnate. I’ve loved many, and many have loved me. With the love, others have hated me. Let them battle their own demons. In the following pages, I’ve collected the majority of “songs” I’d written years ago. I say songs, only because at the time they came into my head they came through on a melody. I had planned on becoming a songwriter at one time in my life, but that was never my dream. So I never pursued it. Instead, I decided a little while back that I still needed to publish them, but as a reflection of what emotions and powers have shaped me. I added short descriptions to these “poems” when I first started putting them all in one place. This collection is about LOVE, and everything that goes with it.. the searing passionate love, the torturous-I’d-rather-die-love, the despair of never feeling it again-love. And everything in between. Some of the blurbs attached to the poems I chose to keep the same, because they (when originally written) showcased who I was at the time. How I felt, how I saw life. This is after all, a deep look into my own personal journey. And if for no one else’s understanding but mine, I chose to keep them as they were. Others, I either re-wrote them to sound a little less offensive, or I added to them as an update. I have changed the names of the people I discuss, and some of them I discuss frequently because they were such an influence on my life. I’ve divided this book into “Chapters” named after each of the men who’ve accompanied me in love. Whether they ever felt the same, I do not know, nor do I ever wish to know. Yet another reason to have changed their names. To those men that helped me find myself, I am eternally grateful. I had to kiss a lot of frogs before I found my one true Prince. And that you knew best. Very set in my ways. Yeah, don’t see that happening. Really not easy being rejected by a man. Certainly not by your father who you feel is supposed to shelter and protect you... No matter what. I could write more, but, there’s not much left to say…….. This is my update.. I am 36 right now, my dad has been gone for six years. Right before he died, my family (including my kids) went to see him at his bedside. It was one of the single most painful moments of my life. I’d spent fourteen years, not seeing him, not talking to him. Ten of those years I was mostly a single mom. A single mom with three kids, living in the same town, at times-right down the street. I’d gotten used to not having him in my life. I had to make my own way, and this inevitably sent me into the arms of the next newest savior. Then, right at the end, when his departure from this world and my life for good was unavoidable, I had to lose him all over again. We made peace with each other. He hugged my son. My son, who for fourteen years could’ve learned so much from his grandpa, but he and his sisters were denied because of a foolish man’s pride. There was no man that had a greater influence on my early adult life besides my Dad. Everything I did was dictated by what was and wasn’t acceptable with him. I have two black kids. So I left home at fifteen and at times, only had my children for family in my life. “Women should know their place, they should be subservient to Man.” That was the toughest lesson to unlearn. I’m grateful for everything, good and bad my father taught me. I miss him terribly. I feel robbed. Again, thank you to all of you who have already downloaded it/read it, I REALLY APPRECIATE IT!!! You can leave your reviews/feedback below, or on the amazon page.